The collaboration between the two industry leaders will give both the independent grocer and their shoppers a true omni-channel experience. Freshop, Inc., a comprehensive grocery e-commerce solution, and AppCard, the leading personalized marketing and shopper analytics platform for retailers, announced today that they have expanded their partnership with a new integration. The integration allows grocers to connect customer identities with purchases made online via Freshop.com as well as in-store, creating a full 360° view of their shoppers. Through this integration, grocers on the Freshop e-commerce platform will be able to leverage AppCard’s turnkey rewards programs and AI-powered shopper analytics engine to segment customers and deliver personalized offers via text messaging and email. Likewise, grocers on the AppCard rewards platform will gain access to Freshop’s e-commerce solution to create a truly omnichannel shopping experience for their customers. With AppCard and Freshop independent grocers can actually leap ahead of other online offers with our combined focus on grocery. The integration will provide a seamless shopping experience for customers with single sign-on functionality. Integrating AppCard with Freshop will undoubtedly enhance the overall customer user experience both online and in-store. The shopper can now earn and redeem rewards wherever they choose to engage with their favorite grocer. This continues AppCard’s momentous growth in the independent grocery industry following the acquisition of ProLogic Retail Services, which is already fully integrated with Freshop for both loyalty and digital coupons. Independent grocers can contact AppCard at grocery@appcard.com to learn more. Based in Rochester, NY, Freshop, Inc., offers proven online grocery e-commerce solutions. More than 500 stores use Freshop to create a more personalized and engaging shopping experience across the United States, the Philippines, Bermuda, Cayman Islands and even Saudi Arabia. The company’s online grocery shopping platform features a flexible, store-branded platform with complete administrative control for stores. For more information, please visit www.freshop.com. AppCard, a personalized marketing and CRM platform for brick and mortar retailers, uses smart data capture and machine learning to analyze, target, and engage with customers. The technology empowers businesses to deliver the right message, to the right customer, at the right time via text, email, and push notifications. Retailers on the platform include grocers, quick serve restaurants, franchise systems, health and nutrition shops, retail specialty stores, managed food services and more. AppCard processes nearly 500 million transactions, and reaches nearly 17 million US households. AppCard is funded by Jerry Yang of Yahoo, Peter Thiel’s Founders Fund, Eric Schmidt’s Innovation Endeavors, Alexander Rittweger of PAYBACK, and PLDT Capital. For more information, visit appcard.com/biz. 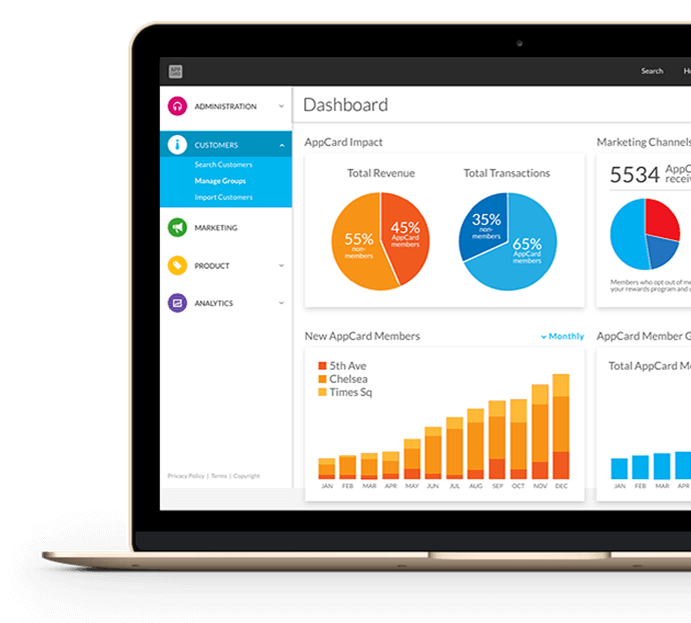 Contact us for a personalized demo to learn more about how AppCard works and discover how data-driven marketing can increase customer retention.